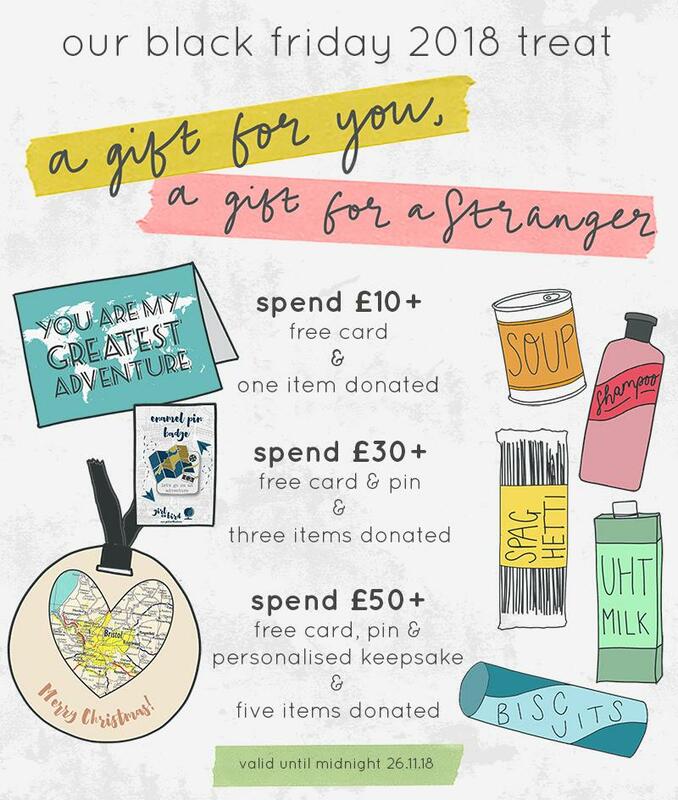 This Black Friday weekend, for every purchase over £10, you'll get a free gift, but not only that - Girl and Bird will donate an item to a local food bank. When you spend £10-29, you'll get a free card from the new collection. One item will be donated - food, toiletries or household items. When you spend £30-£49, you'll get a free card, as well as a free pin. Three items will go to a food bank. When you spend £50+, you'll get a free card, pin, plus a ‘Merry Christmas’ keepsake personalised to a location of your choice. Five items will be donated. Let me know if you have a preference for the card or pin. No code necessary. Donations will be made to a food bank in South Bristol. Valid until midnight 26.11.18 on www.girlandbird.com and my Etsy store.